Although this winter started with 4 to 5 great gray owls here in Ottawa, the number has dwindled down to only one in April. The rest likely have moved on. The remaining owl was pure joy to watch and photograph. I have seen many great gray owls over the years but this one is the most active great gray I have seen. Hunting all on its own too. The owl was frustrating to see as it tended to disappear for several days at a time only to show up for 2 days and then leaving again. Often it would come out only near sunset to dusk so photography was limited. I learned to use the higher ISO's on the 7D MK2. The last couple of weeks kind of make up for it however with plenty of activity earlier in the afternoon and the owl showing for 8 days straight or more. But no one has seen it again for a couple of days. Photographed last week. Canon 7D MK2 and 70-200 2.8L + 1.4x III. Handheld. Thanks for looking. Excellent head on flight shot, Wilson. well done on getting the final shot's of this owl, until next season, I like the head on capture WILSON. Quite a striking head on shot- just look at those eyes! Seems your persistence has paid off. Another beauty. 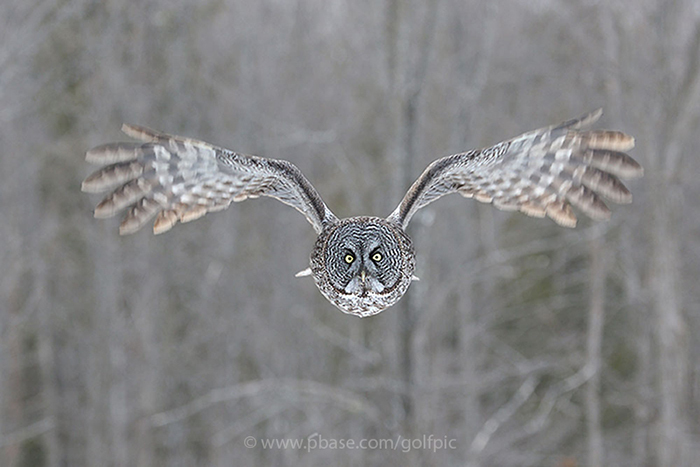 I love the incoming angle and see the owl's face straight on. I wish we had GG Owls here.